We’re approaching the 100th Day of Kindergarten with our children, or as I like to say 100 Days Smarter! We did a few activities to learn about 100 and thought we’d share. 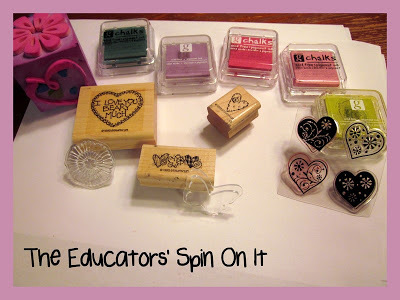 I love these ideas because they teach multiple concepts in one. We enjoy providing learning opportunities and projects for our children afterschool and/or on the weekends with our 5 year olds. Because our time is limited, it’s great when we can tie in multiple concepts into a project to help save on time and most importantly to make it more meaningful. 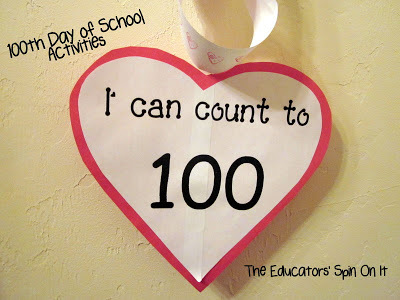 Here are a few activities that we created that relate to our 100th day of school that we’re celebrating this week but also ties in Valentine’s Day, Random Acts of Kindness, plus teaching Math and Reading. 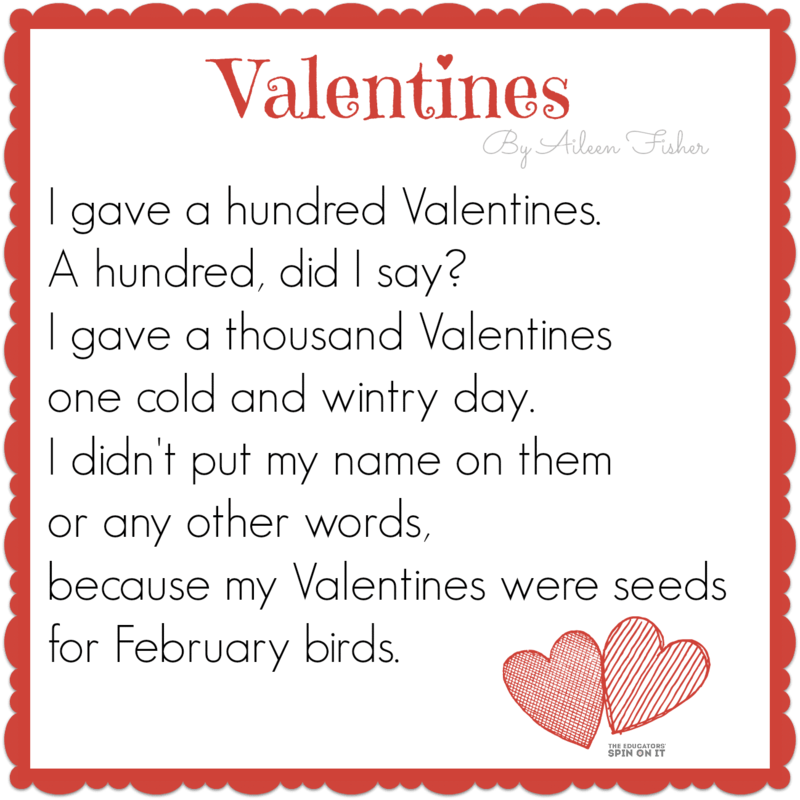 We found a special Valentine’s Day Poem and thought it would be nice to give the birds their very own Valentine. We’ve been working on Random Acts of Kindness the past month. We printed out the poem for our wall to memorize and then created our Bird Seed Heart. Draw a heart onto cardboard and cut out. Create a hole at the top to attach the string from at the end of the process. Then generously spread peanut butter onto the cut out heart cardboard. 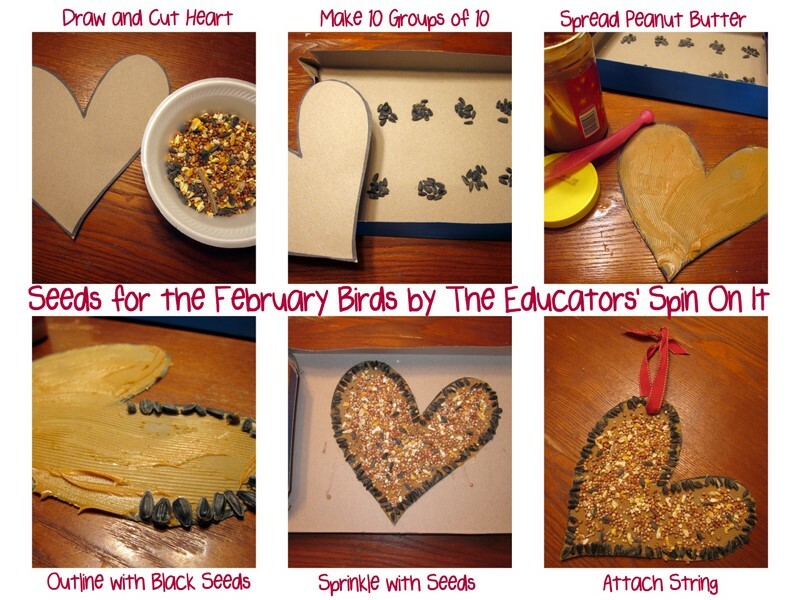 To create our Bird Seed Heart we collected 100 Black Sunflower Seeds to line the outside and then sprinkled our”1000″ seeds in the middle on the front. Make sure you press the seeds down so they done fall off when you pick them up. Then insert the string into the whole. Hang outside and observe. Hang up the Poem somewhere on your fridge to remember the special poem. Here’s a Printable for you to use. 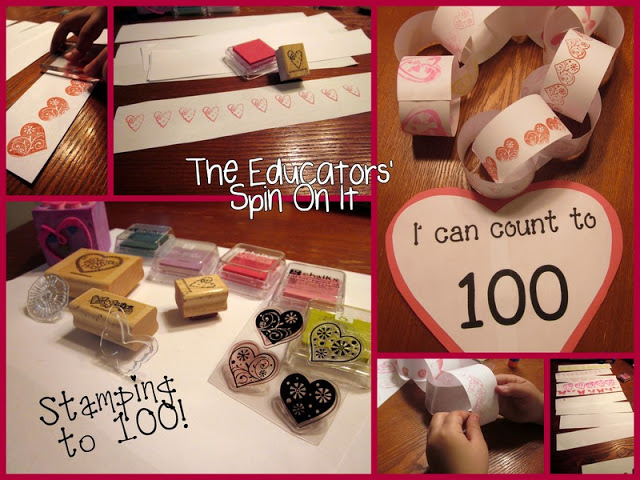 Grab 10 Stamps and 10 Paper Strips and get stamping to 100! You can use themed stamps to create many different crafts! We’ll be making Valentine Cards, Family Mailbox and Valentine Patterns with these too! We worked on learning the concept of 100 by grouping things into groups of 10. 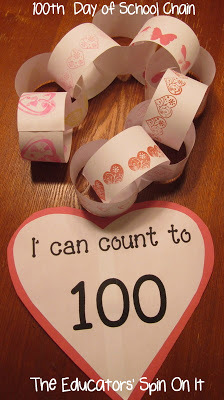 I had my daughter choose 10 different stamps and then she stamped them on 10 strips of paper to make a paper chain. We practiced counting by ones and by tens to 100 as we created it and using the 100 Number Chart. Here’s our finished project, she couldn’t wait to hang it up. On the back we have Happy Valentine’s Day too! We had to read a few stories too about the 100th Day of School. Here are some of our favorites. These are great ideas! I love your bird seed heart. 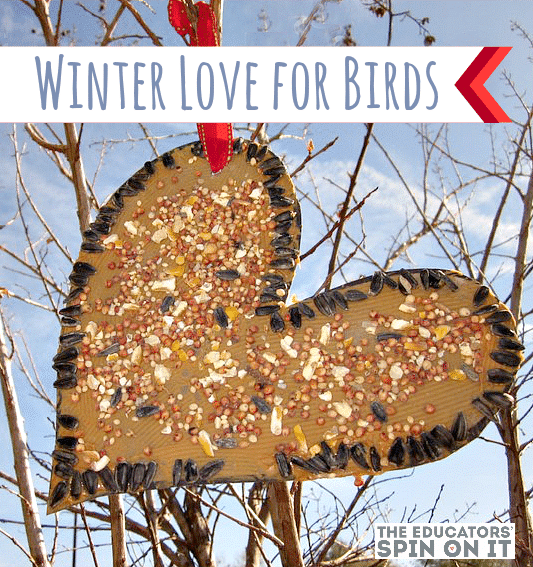 We're working on a bird theme unit now and at some point we'll do a bird seed craft, this just might be it! 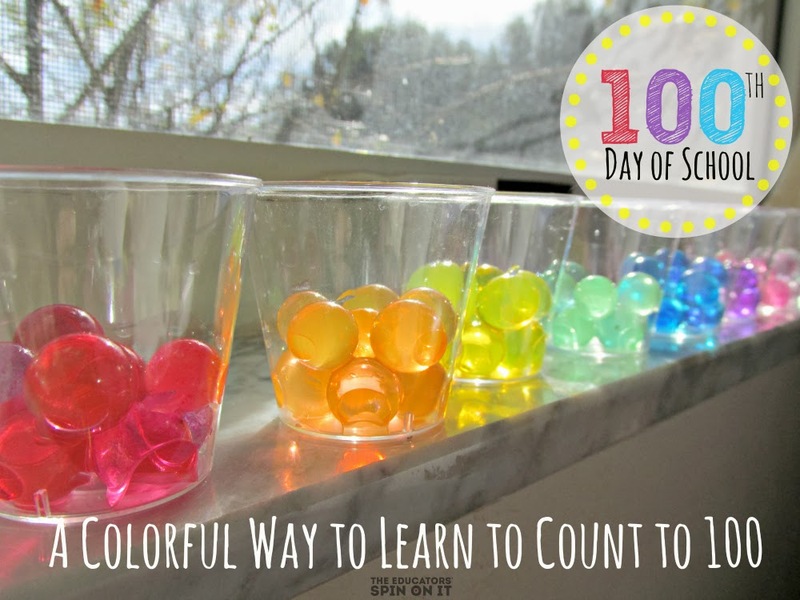 All these are wonderful ideas to celebrate 100 days at home! Thanks Little Wonder Days and Raising a Happy Child! 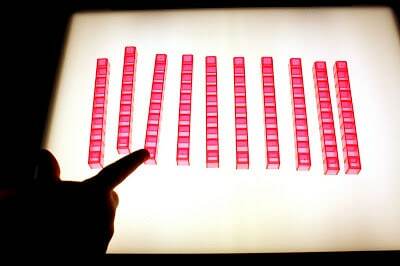 It's amazing to see my little 5 year old counting to 100 by 1's, 2's 5's and 10's. Hard to believe half of the school year is already over. 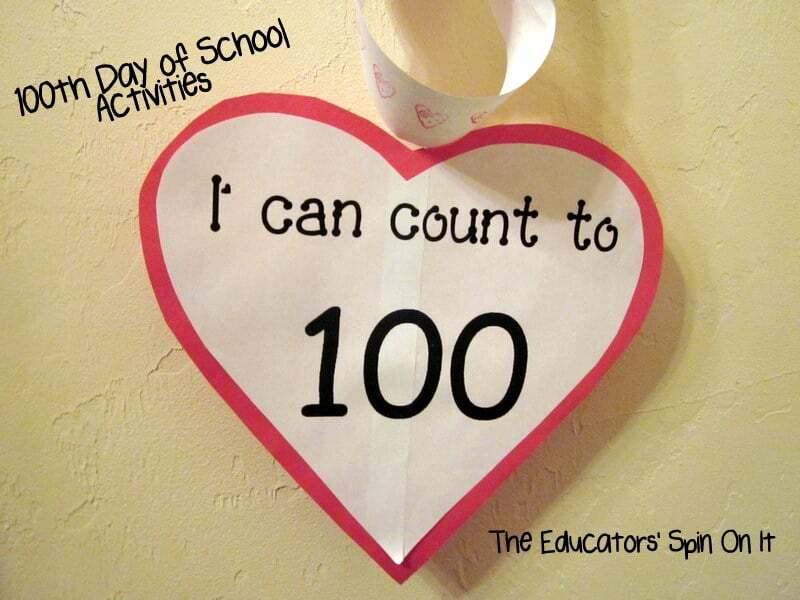 We just celebrated our 100th day of school too! Fun activities you did. I love that you took the base ten blocks on the light table. Great idea. We are celebrating that at our school this week! The first time I used the little poem you shared, was back in 1986 when I was teaching at a preschool here in Tulsa, Oklahoma. That poem has always been listed at anonymous. I have never heard Aileen Fisher. Just thought I would pass this on to you. I haven’t learned everything yet but I am 74 and first used it 30 years ago. I am still researching Ms Fisher. Thanks for letting me know, I used this back in 1995 a few years after you and had always had it sourced to Aileen Fisher. I’ll be sure to do a little more research but all sources I see tonight also mention her as the poet who wrote it. Thank you so much Ramona for visiting The Educators’ Spin On It.